Carry gear without using a belt & easily reach your items in confined spaces, such as vehicle/aircraft cabs where your elbow room is restricted. A more comfortable alternative to belt holsters as you won't be poked by your gear while seated, this convertible harness will expand your carrying capacity beyond what you can comfortably carry on your belt. 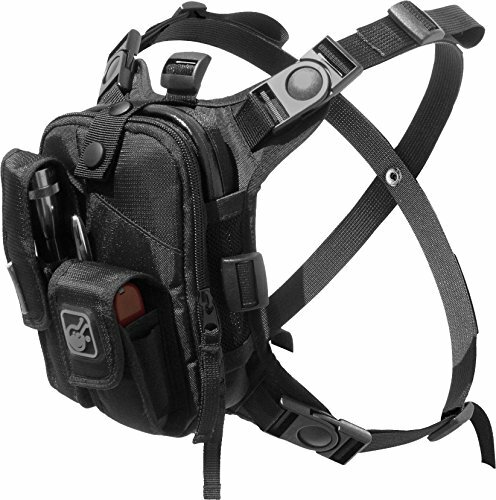 The content-specific Covert modules carry tools/equipment in 5 configurations which you choose to suit your task (images shown are for harness usage demonstration only - your purchase might be a different style from the model shown). Keep expensive electronics and gear safe, close and (if need be) out of sight while in crowds. Highest quality materials and hardware, combine with excellent design and workmanship to produce the finest, precision equipment holster of its kind. It far exceeds the standards you are used to for this type of product. It is used by professional guides, military, pilots, independent travelers, snowboarders needing to tune up equipment on the slope, and countless other users looking for the best system to carry frequently used personal equipment. Also functions as a last-ditch, always-close survival kit. Re-designed 2013 Model!! The 2013 version has upgraded tougher nylon fabric, super plush, quilted micro-suede interiors, and an added loop velcro area for attaching our StickUp holsters. If you have any questions about this product by HAZARD 4, contact us by completing and submitting the form below. If you are looking for a specif part number, please include it with your message.